What Upload Speed Do I Need to Live Stream? This post explores identifying upload speeds required for broadcasting, finding your current bandwidth, and troubleshooting potential connection issues. It's the main post in our series on upload speed for live streaming. Most broadcasters recognize the critical role of network connections in creating great live video. Our answer— to the frustration of our inquirers— is almost always, "It depends." Unfortunately, the response involves more intricacy than a simple calculation. This post provides the information, context, and tools needed to estimate the network speeds you require for a high-quality broadcast. What Upload Speed Do You Need To Broadcast? How Can You Determine Your Current Bandwidth? What Can Affect Your Internet Connection? Before we get started, let’s cover some basics. On the internet, there are two types of data transfers— uploads and downloads. Uploading is the process of sending data from your local device to the internet. Posting an image on Facebook, sending an email, and live broadcasting are all examples of uploading content. In contrast, when you receive information on the internet to your device, you are downloading that content. Downloading is not limited to copying files on the internet for local storage. The action encompasses any moment when your device retrieves information on the web. You download information to watch a video, check a score, or load a new webpage online. Everything you access on the internet— text, images, videos, and styles— requires downloading before you can view it. Bandwidth refers to capacity of your network for uploading or downloading data. Think of it as the pipeline for information transfers between the internet and your local network. Larger information requests require greater bandwidth to squeeze through. Smaller pipelines cause stoppages, slowing the transfer process. Upload and download speeds are the measured pace of data transfers between your network and the internet. That speed— like bandwidth— is measured in megabits per second (mbps). Megabits are comprised of bits. Eight bits make up one byte— a unit you might have seen presented as MB or megabyte (1,000,000 bytes). The time it takes you to download content depends on the size of your file and your network bandwidth. What Upload Speed Do You Need to Live Stream? Like download speeds, upload speeds depend on file size and bandwidth. For live streaming, the video file size depends on the quality of the content. High-definition 1080p video has more pixels— and therefore more data— compared with a video with 480p video. More information to transfer requires a higher upload speed. The table below shows our general recommendations. The values in this table are rough estimates based on stable network environments. They can also vary based on encoding formats and content type. The above calculations address standard-definition and high-definition live streaming. This post covers upload speeds for 4K live streaming. To determine your current bandwidth, check out this free speed test. The results provided will give you a rough estimate of your upload and download speeds provided by your internet service provider (ISP). Run this test in various conditions. The number of people tapped into a network impacts upload speeds and can cause fluctuation. If you’re planning to broadcast an event with large in-person attendance, testing on a Tuesday afternoon with no one around may not paint an accurate picture of your available bandwidth. The numbers you see on your speed tests may not reflect the network specs your ISP claims to provide. Available bandwidth fluctuates all the time, which is why your internet seems slower on some days and faster on others. Various factors affect your connection. Here are a few of the common causes of a slow internet connection. Your bandwidth is spread among the people using that network. If your organization provides wi-fi to everyone in the building on the same network as your live stream, you dilute the bandwidth dedicated to your broadcast. You could make your internet connection private so that people need a password to access the connection. You can give your live streaming encoder quality of service (QoS) prioritization to allocate a certain amount of bandwidth on your network. QoS can be complicated, so you may want to talk with an IT professional before you start experimenting. Routers are small devices that let you connect devices to the internet through one physical internet connection. You’ve likely experienced resetting your router from time-to-time to reset your internet. Some routers have a broader range and include more cores than others. These more robust routers process and queue information quicker. The effectiveness of any router— powerful or limited— depends on its storage environment. Temperature, dust accumulation, and age can wear on the router and slow the central processing unit (CPU). If you think your router may be affecting your network connection, there are several ways to test it. Storage is as important for cables as it is for routers. If cables are not treated well, they can deteriorate and perform poorly. Cables left crumpled on the floor or subjected to frequent foot traffic can bend and weaken. Damaged cables may struggle to perform their jobs. Testing your internet speeds and network equipment are the first steps in ensuring a strong environment for your live stream. However, you will never know exactly how a live stream will perform until you test the broadcast itself. Take time to run your broadcast, simulating the conditions of the event you intend to stream as closely as possible. You don't host a live event without a dress rehearsal. Likewise, you shouldn't broadcast a live event without a proper run-through. High Efficiency Video Coding (HEVC or H.265) is a relatively new video codec that compresses video twice as much as its predecessor, Advanced Video Coding (AVC or H.264). Without compromising quality, HEVC halves the bandwidth requirements of AVC. To use the power of HEVC, you must have a HEVC capable encoder. 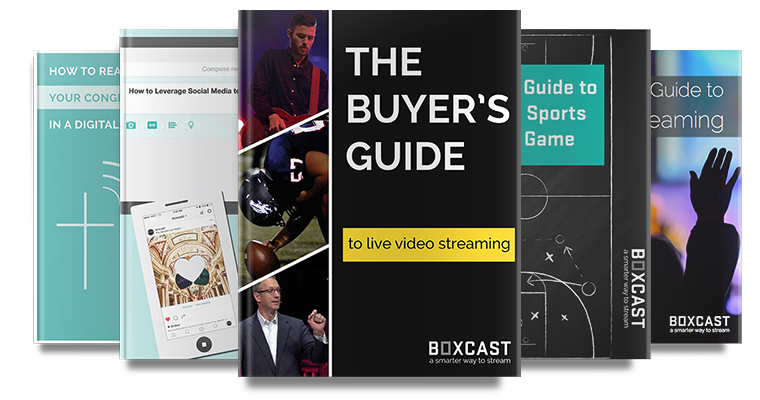 The BoxCaster Pro makes HEVC encoding accessible to everyone. There is no easy answer to “What internet speed do I need to live stream?” but knowing the factors that affect your network can help you create the internet conditions you need.